Sept-Iles Mazda | Get the 2018 Mazda MX-5 Today! 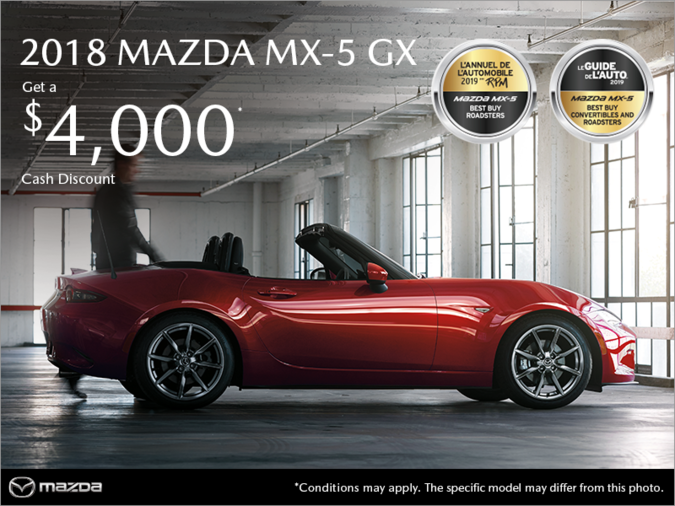 Purchase the 2018 Mazda MX-5 GX and get a $4,000 cash discount! The discount up to $4,000 (deducted from the negotiated price before taxes) is offered only with the cash purchase of new 2018 Mazda MX-5 models in stock that are sold, registered and delivered up to February 28, 2019. Licence, insurance, taxes and RDPRM registration fees of up to $88.12 (including third-party registering agent fees) and taxes are extra. Dealer may sell/lease for less. Dealer order/trade may be necessary on certain vehicles. First monthly payment, RDPRM registration and registering agent fees due upon delivery. Offers valid February 1-28, 2019, while supplies last. Lease and finance on approved credit for qualified customers only. Offers subject to change without notice. Visit mazda.ca or see your dealer for complete details.